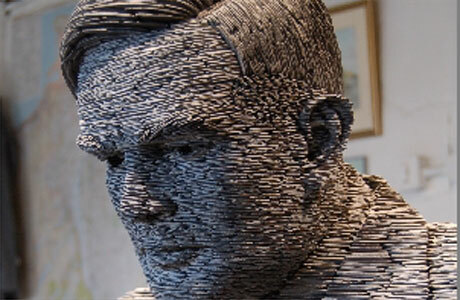 Alan Turing is of course being honored this year with many events of all kinds. Today we thought it might be fun to have a light approach to Turing. In the next section we have a simple multiple choice set of questions about Turing, including his life and results. One rule is we suggest that you take the test without searching for the answers from the web. You are on your honor, but have fun no matter what. None of the above—i.e., all invented such a definition. Turing got a Ph.D. from which institution? Turing never won the Turing Award. He was awarded the first one posthumously. An existing award was renamed for him after his death. No major computer science theory award is named for a living person. Proving it cannot contradict any natural law. We hope you have enjoyed the test, and we invite you to add your own favorite questions in the comments section. At some time soon we will give the answers. I got this immediately—and something I carefully wrote in the intro of this item makes your wording allowable. iv. none of the above (all were mentioned in the letter). The answer to John’s question is: He didn’t mention computable numbers. is 1 divided between the length of the wave under gravitational pressure. the sequential logic value of an idea is Ziz. Ziper drives, Jar etc. now are a comercial use. the encryption in an empty space in motion is on the Prowl. Germany Shark encryptions are similar to the US, CCCP, encryptions on Nuclear Missils launching codes. al this codes are being monitored at different locations as Arrecibo in Puerto Rico, and listening stations around the world. Has anyone ever told you that you sound a little like the Time Cube guy? Answer c) : according to Wikipedia, he rediscovered by himself the proof of the central limit theorem. Serge- you cheated- you weren’t supposed to look it up. I can’t complain- I cheated in that I used Wikipedia to make up the question. I think its interesting that Turing was so well rounded within math. Ramsey Theory was put there as a joke answer since Turing got his ugrad degree in 1935, way before Ramsey Theory was an area of study, though Ramsey’s paper came out in 1928. I’m not so surprised that Turing was well rounded within math, since he was a downright genius. But it’s interesting anyway to note that computer science was invented in the first place by mathematicians and logicians. I’m going to guess iv, as this is a natural question motivated by his research. i is motivated by cellular automata, which weren’t known back then. ii is something he wouldn’t have been interested in. iii is something that nobody believed existed back then. v Asymptotic computation run-times weren’t thought of back then. I just peeked. Nice question, John.